To what lengths should science go to produce food to satisfy the consumer demand for convenience at one extreme, and widespread hunger on the other? For a dozen years, artist Kyle Dillehay has been concerned with the health and ethical issues surrounding genetically modified food – so much so that he now grows heirloom varietals for his own family’s table. 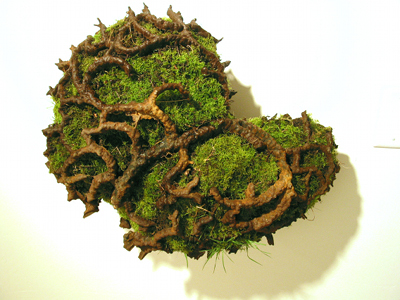 The subject continues to shape his work: “Since my Atlanta, GA, rapid-rail art project, in 2000, I have been creating sculptural installations using a variety of pod-like forms to make statements regarding man’s involvement in changing the genetic structure of plants for his own uses,” he says. These installations have ranged in scale from a major, government-funded train station project to more private art “interventions” involving the spontaneous placement of individual pods in both natural and urban settings that offer surprising distractions to the alert observer. For Sacred Balance, his new installation at the Woolworth Building, Dillehay has positioned dirt-filled, cast iron web-pods in an arrangement so they appear to be emerging from the walls and ceiling. These pods are planted with genetically-modified grass seed that has been engineered to germinate and grow with limited sunlight. The pods at first appear lifeless as they germinate for the first seven to ten days, then release an explosion of vibrant green to dominate the space. 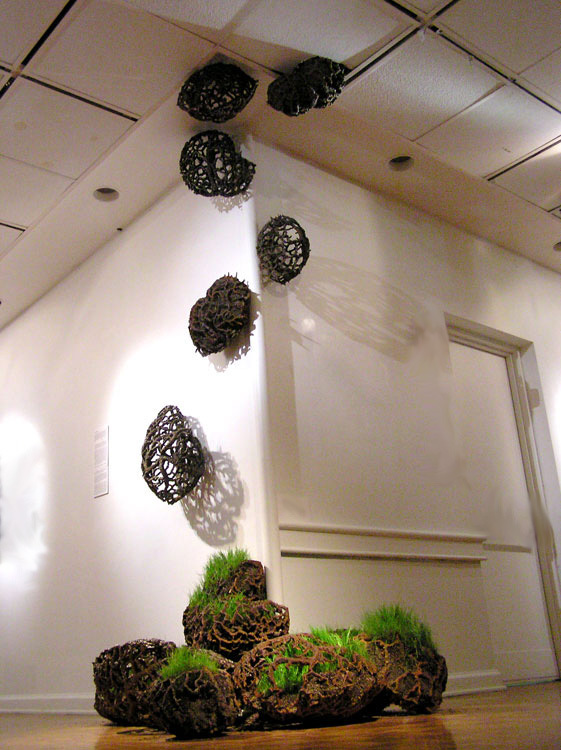 Dillehay will lightly water the grass as needed throughout the exhibit’s three-month duration to maintain the lushness of the grass for viewers passing by. “My main intent is to bring a little awareness to the great amount of genetic engineering that is being performed on even the most basic of plants for human convenience,” he says. Sacred Balance, the Woolworth Building, 11th & Broadway, through June 30, 2012. ← Spaceworks Tacoma Announces Round 6 Rollout!